Our private classes are scheduled for 1 to 10 people. Please call to check available dates and times. ​Lots of hammering to take out your frustrations! Lorrie teaches this class. This is a one on one class with Lorrie. You will learn basics of Lampwork beads. 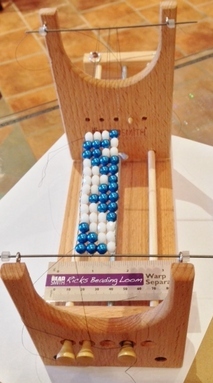 How to make stringers, round beads, dot beads using the stringers. You will also learn Line Beads using stringers. Beads will have to cook in the kiln over night and be available for pick up the next business day. We will not be teaching basic torching skills in this class. With all of the new tools being used this class has been divided into two days. Glenn will be teaching this class. 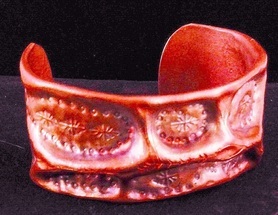 In this class you will be using a rolling mill to texture your back plate and band, metal stamps for the edges, Jewelers Saw, long narrow cabochons and lots of creativity. Since we have so many lapidary students now if you would like to use your own stone just let Glenn know so that we can make sure it will work for the ring you will be creating. You can also being your metal stamps or use the ones Glenn has been creating. This class is for our advanced students who are already comfortable using a torch. 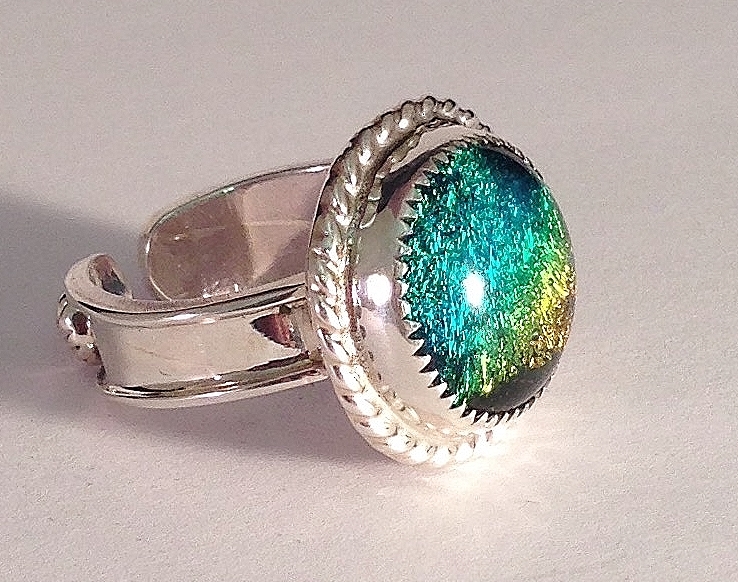 This ring has an open shank with pieces you will be creating in one of our shot plates to attach to the band. You are welcome to use your torch or one of the class room torches. ​ Everything needed will be in the classroom. There are No Castings everything will be made by hand- Leaves, Flowers and Ruffles. There is also a hidden bail to this pendant. ​You are more than welcome to bring your own torch or use the ones in the classroom. This class is for students who have already taken beginning silversmith class or already have experience with torches in jewelry making. Lorrie Padron teaches this class. Shibori,Lacy Stiff Stuff, Ultra Suade, Small Cup Chain, Ear Wires or Posts, SuperDuos, and 2-4 mm Pearls. Lorrie Pardon teaches this beginner level class. 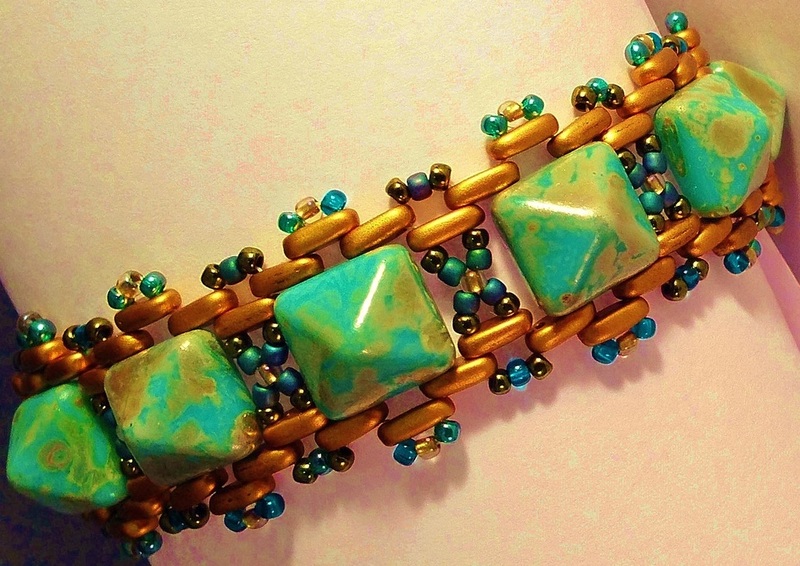 This is beautiful fun bracelet to make. Beginners and advanced students are welcome in this class. Alcohol Inks are permanent, fast drying, transparent, acid free dye inks formulated to create a vibrant look. Alcohol inks can be used on Metal, Glass, Card Stock and any other non-porous surface. In this class you will be working with 10 assorted charms. In the class you will be learning different blending and highlighting techniques. Based on our tree of life this pendant is also using long drop beads. This Pendant was designed by Carolyn from the American Needlework Guild. Glenn will be teaching this class. Certified PMC Instructor Barbara Bessire will be teaching this class. We will be working with silver pmc and the kiln and tumbler you will be left with .999 silver. They will need to tumble over night and will be ready for pick up the next business day. You'll learn the basics of setting up your loom and making your first project. With Ricks loom you don't have the extra threads to worry about. Our store is the Just Because We're Warped Loomatiks for Bell County. Paul Ricks adds a new pattern each month to his Facebook page for the Loomatiks. Shaggy Loops, Jens Pind and many many more!! Closed toe shoes are a must!! This class is to be able to empower students to rent workroom time to work on their individual projects. Lapidary classes cost $50.00 and are limited to a one on one with the instructor. This class must be pre paid to reserve your spot. Semi-precious rock will be available for classes or you may bring your own. Aprons and Eye protection will be in workroom. This is a fresh water system. 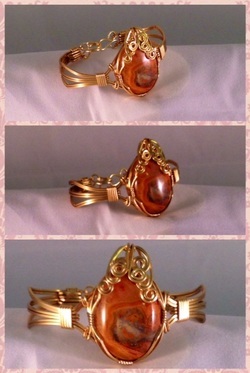 This is an advanced Wire Wrapping class made with your choice of Crazy Lace Cabochon or one of our many other cabochons. Blue, Red, Pink, Green, Black and Purple. This hardest part about this necklace is deciding on the color choice!! This class is easy for everyone. Blue, Red, Green/Yellow, Pink, Purple/Clear,Pink/Clear, Orange and Cream. We have Sunflower or Elephant Buttons and 9 different colors of leather. 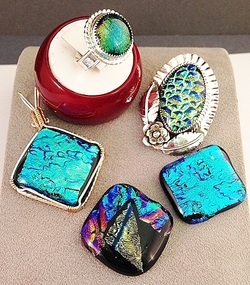 Where you can choose from one of our many Gemstone or Dichroic glass cabochons. a choice of 6 different Czech crystals colors. This is the easiest of our ring classes.